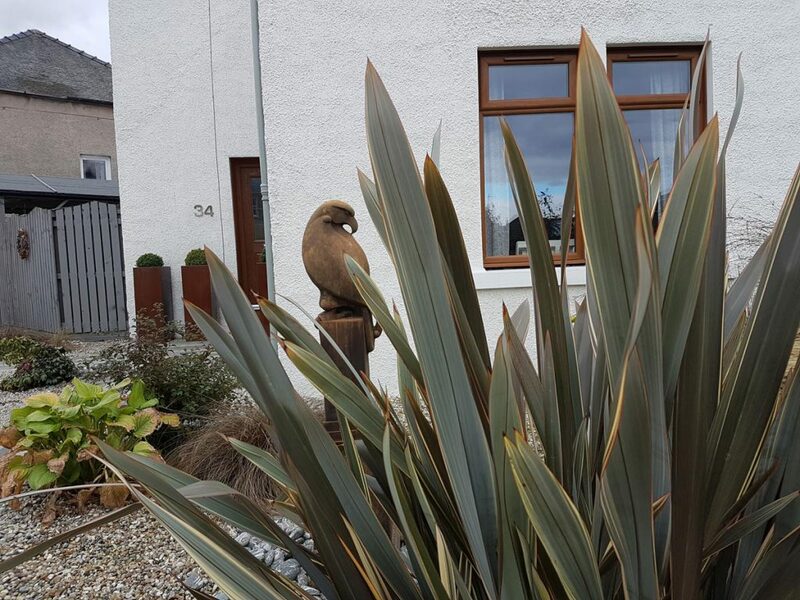 Despite our client’s home being filled with a wonderful array of design classics, the garden was uninspiring. 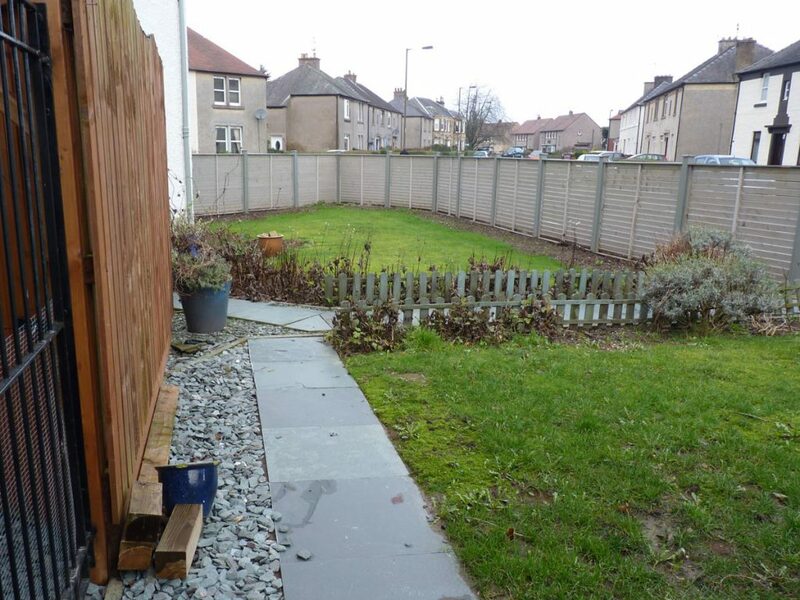 With simply some lawn and a plain path there was nothing to hint at the stylish interiors. 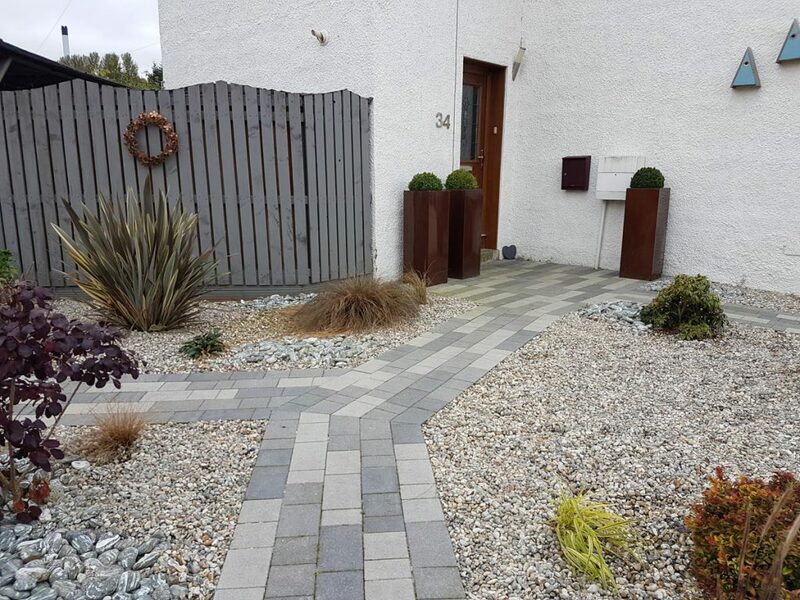 It was up to us to create an exterior to complement this home. 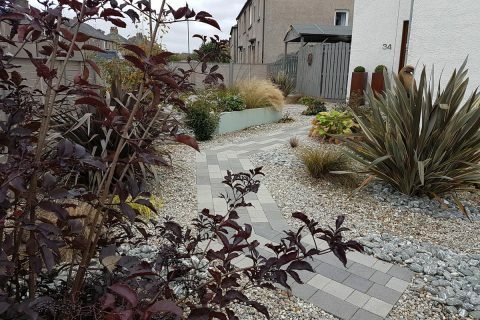 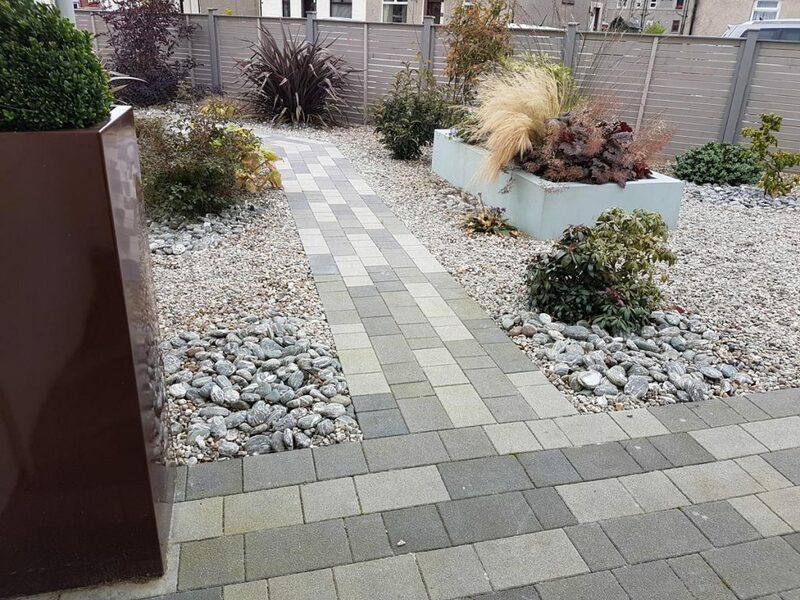 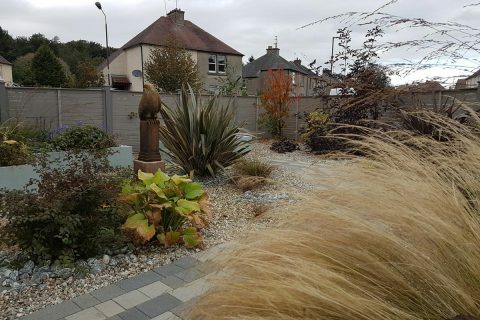 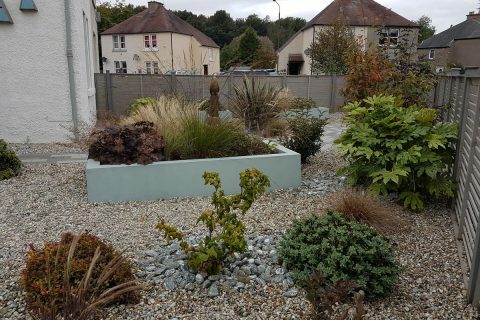 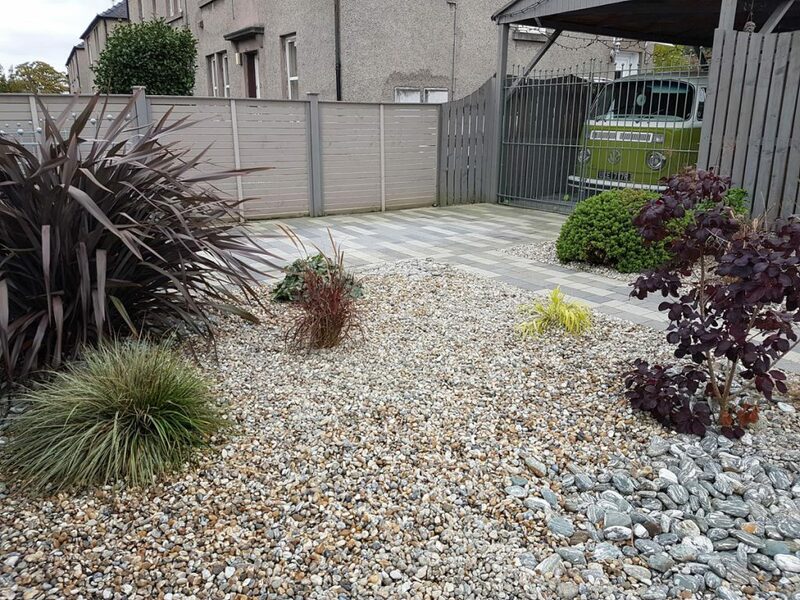 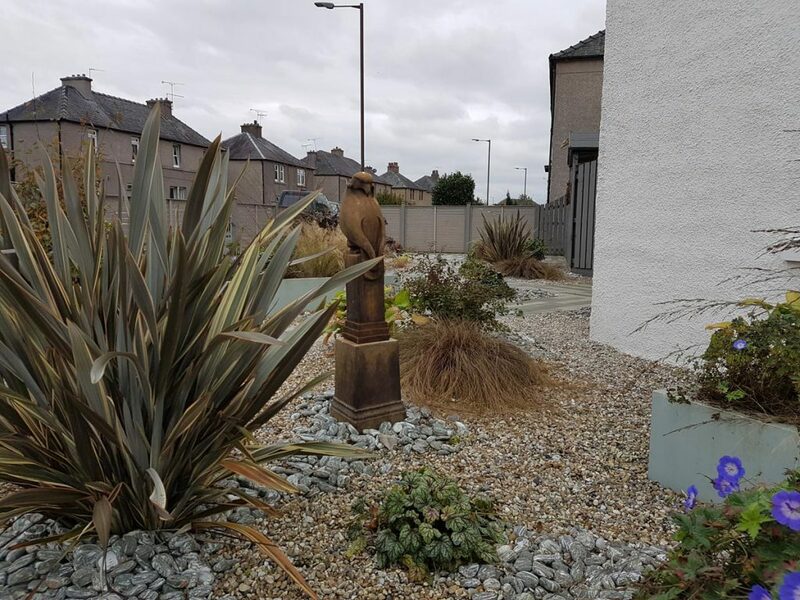 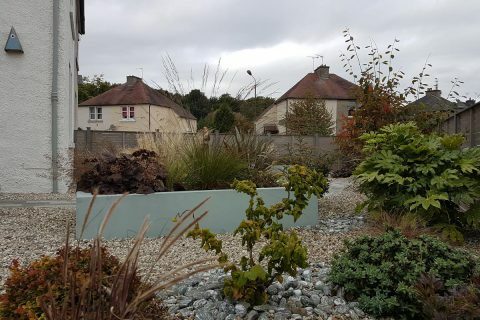 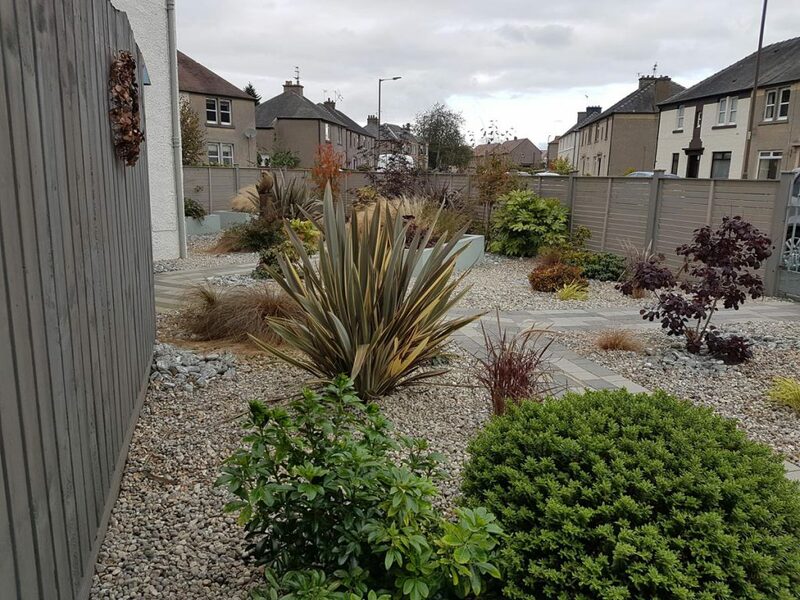 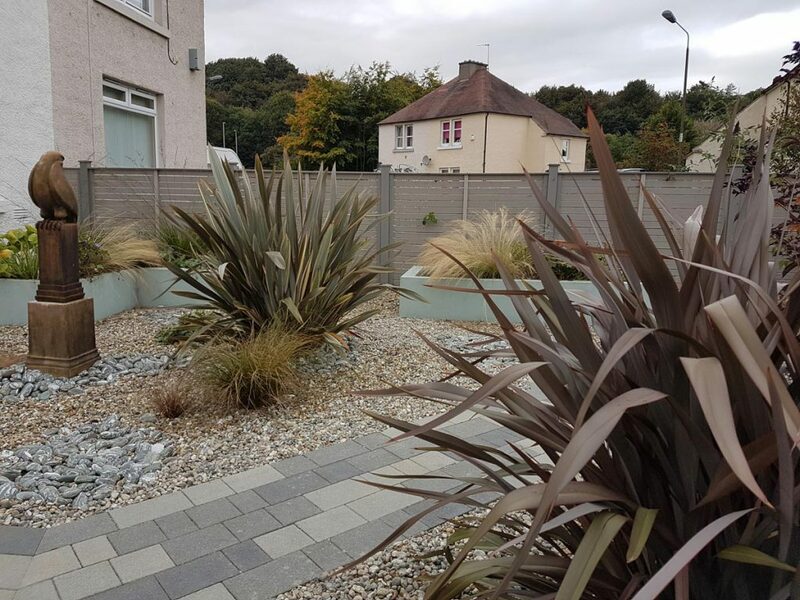 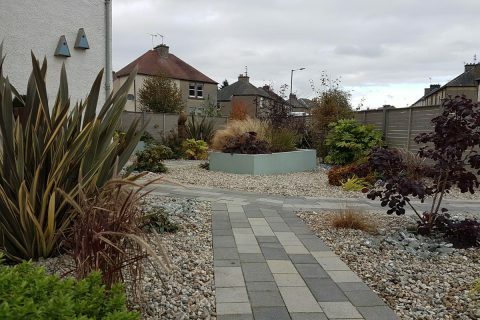 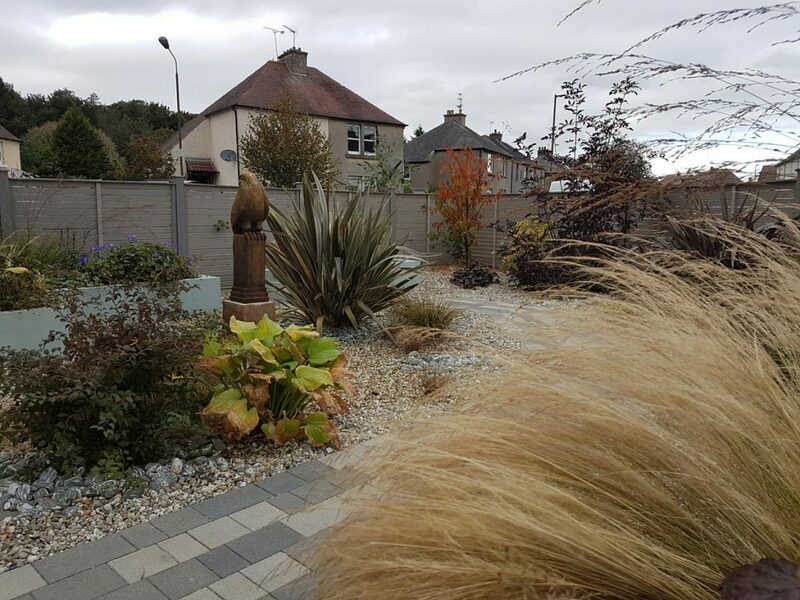 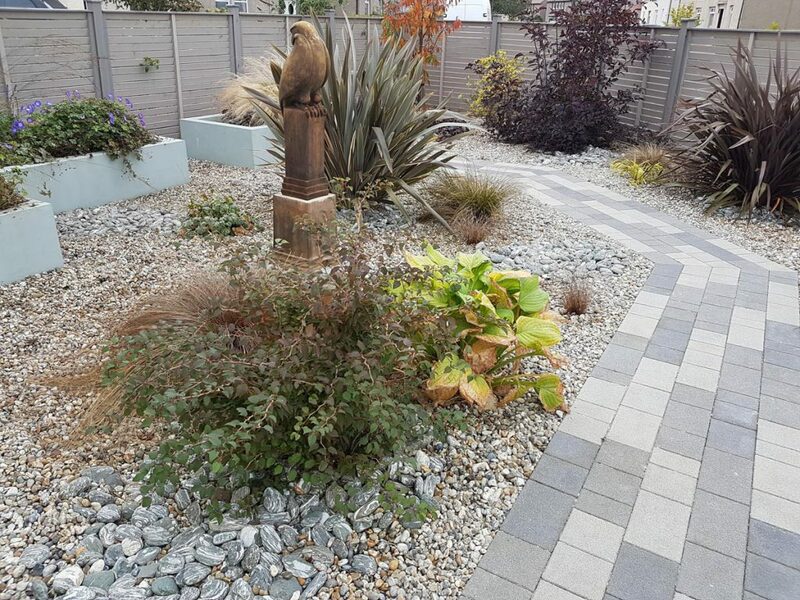 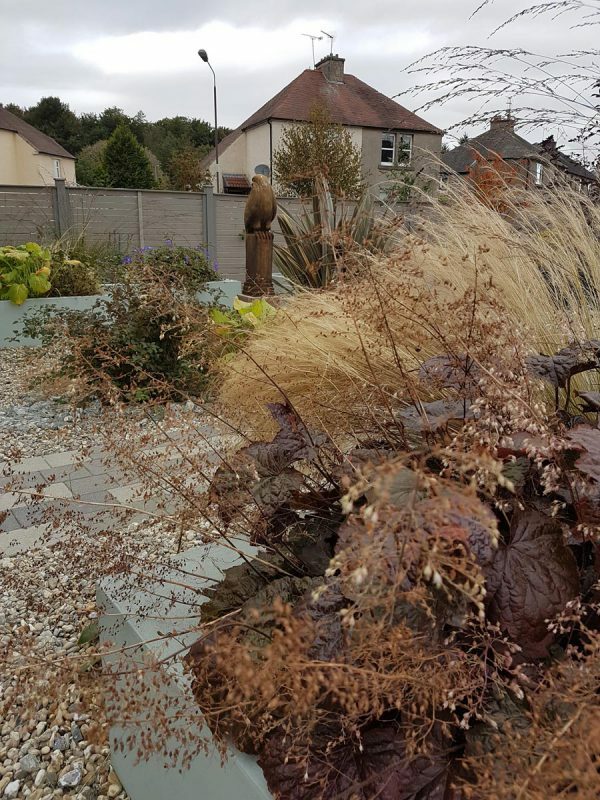 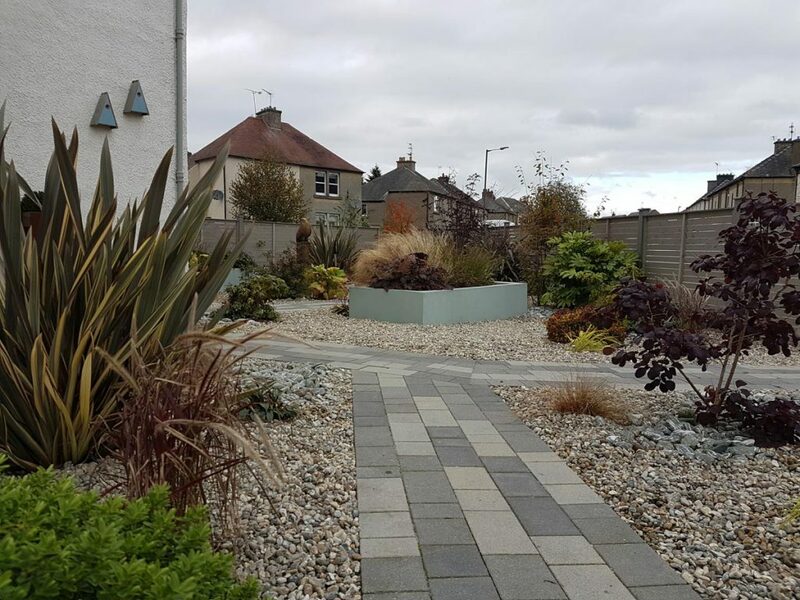 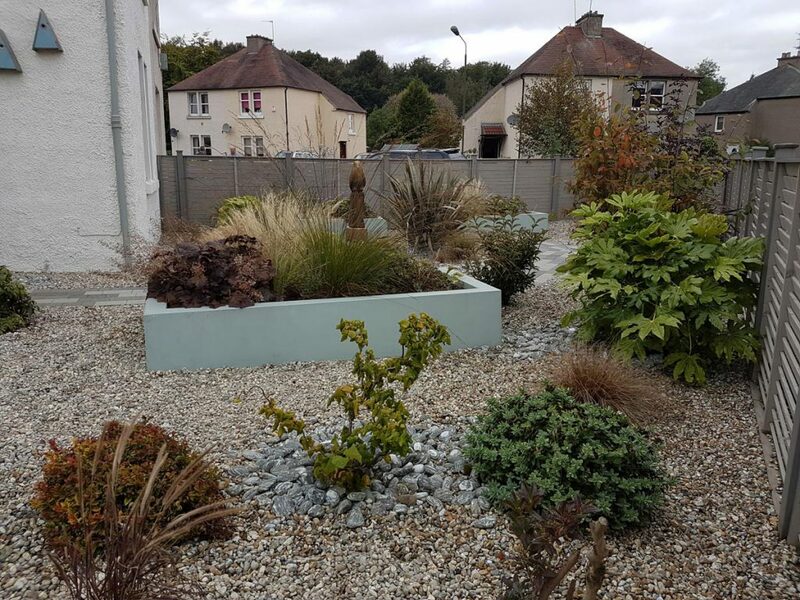 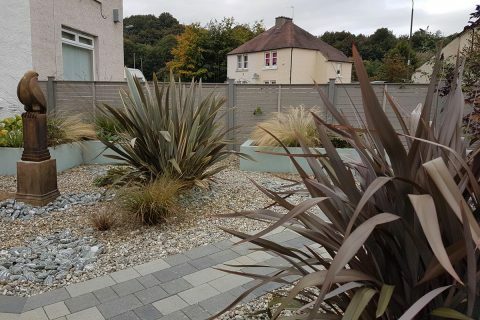 As well as being contemporary and stylish, key points for us to cover in this garden were that it was to be low maintenance and dog friendly.
" 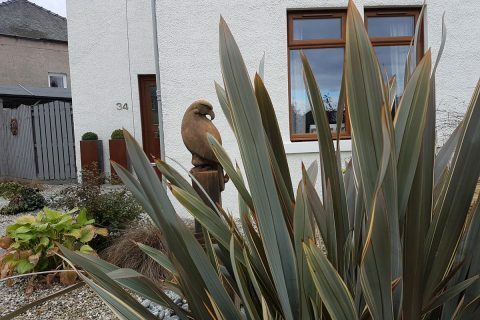 I still smile every time I come into the garden, it's maturing beautifully." 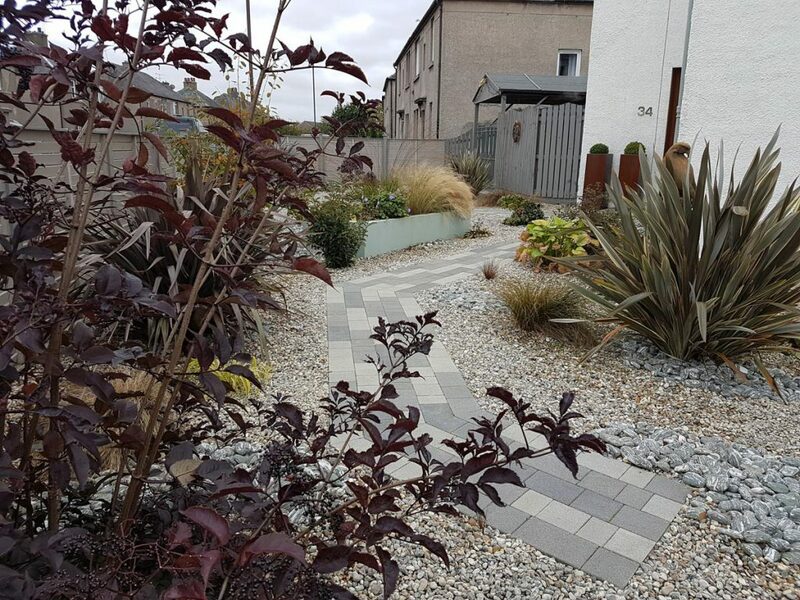 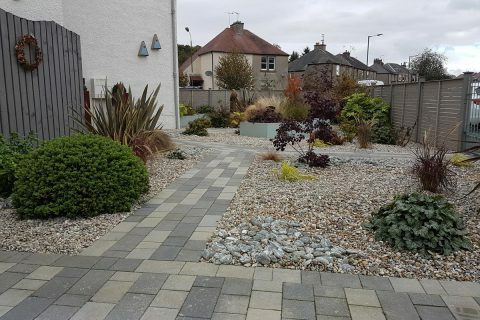 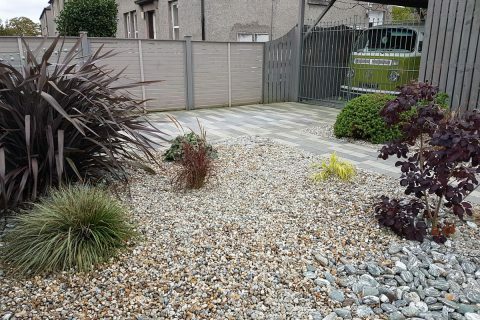 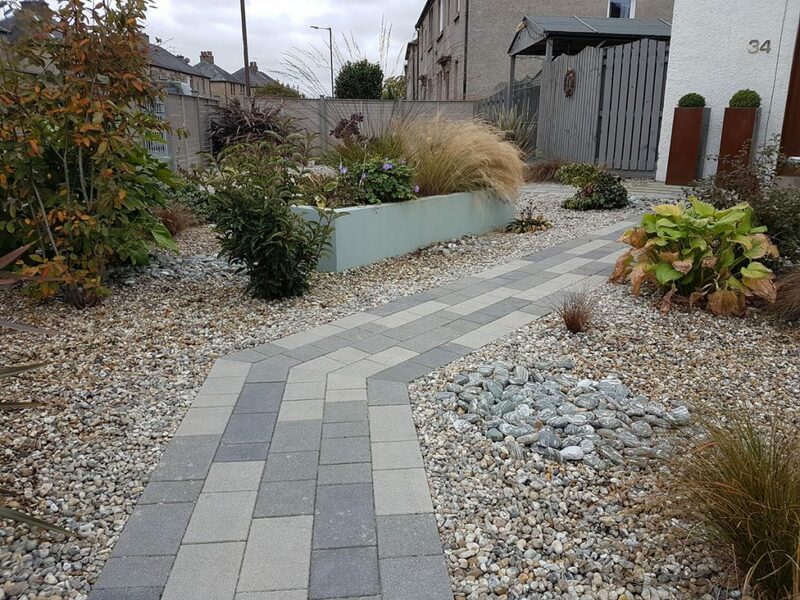 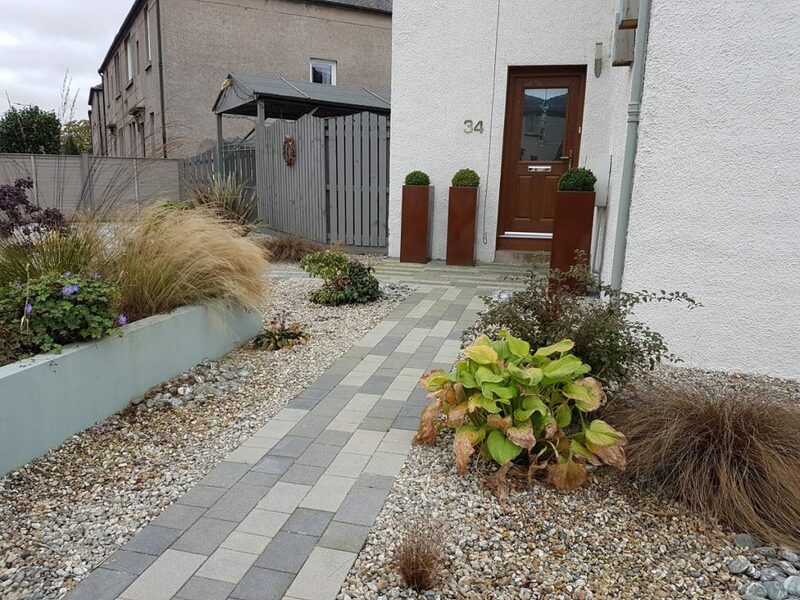 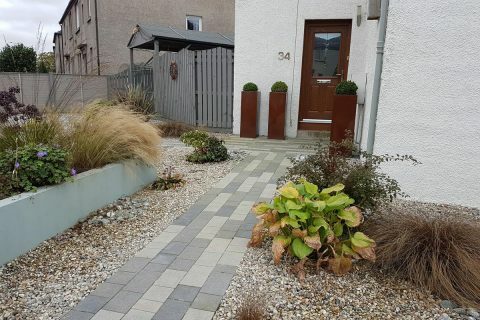 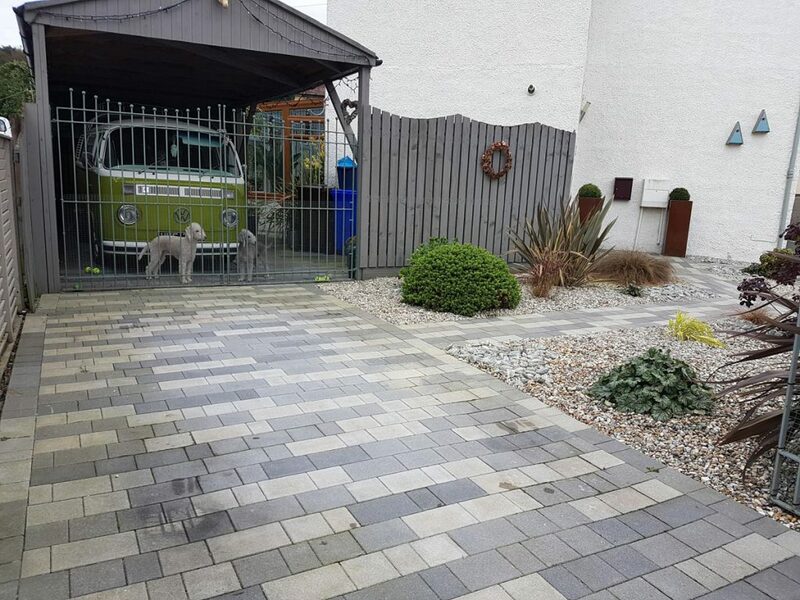 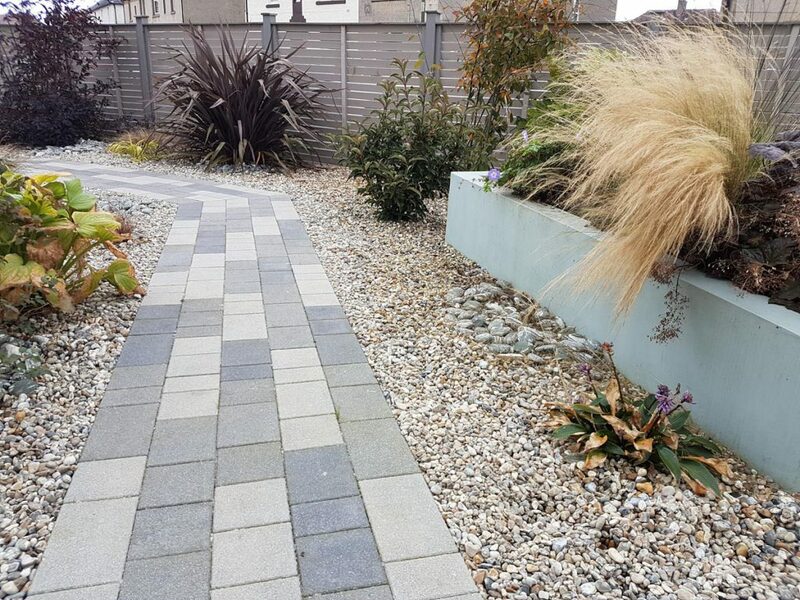 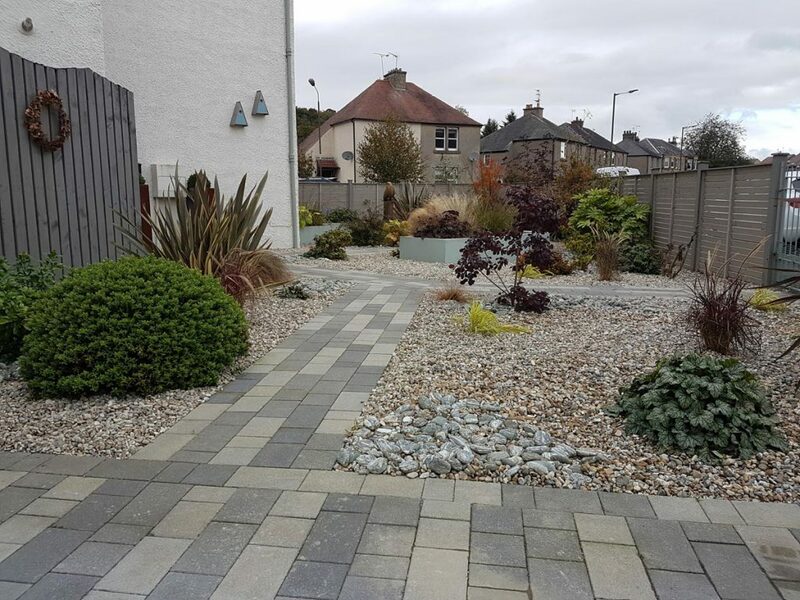 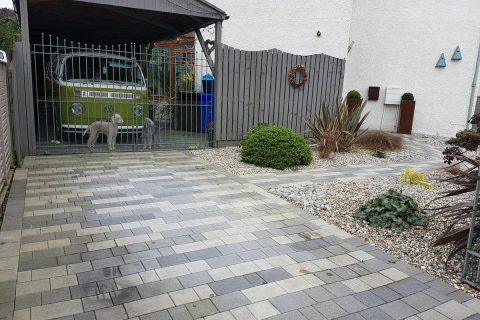 The existing path was replaced with a modern planked paving in three shades of grey creating a welcoming path to the much wider front door area. 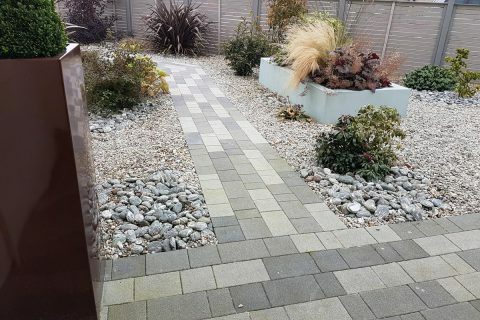 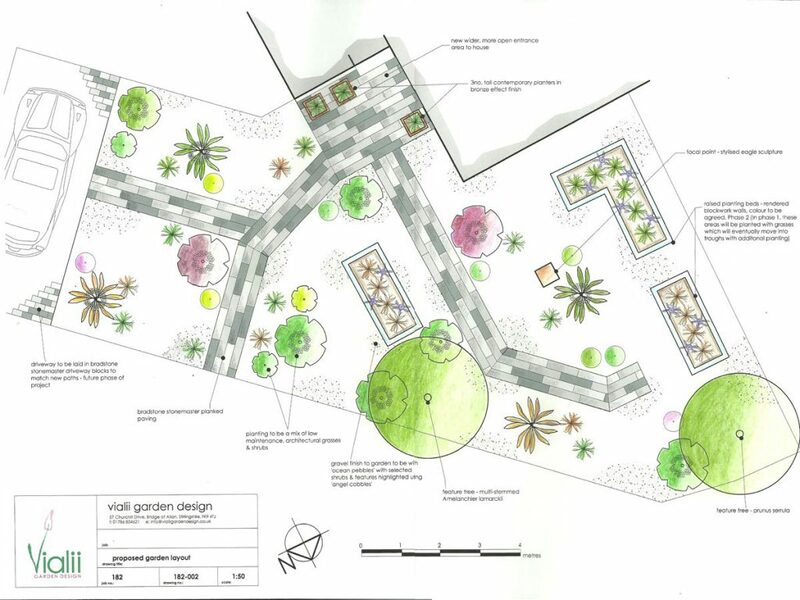 The paving links to the driveway as well as creating a journey around the rest of the garden. 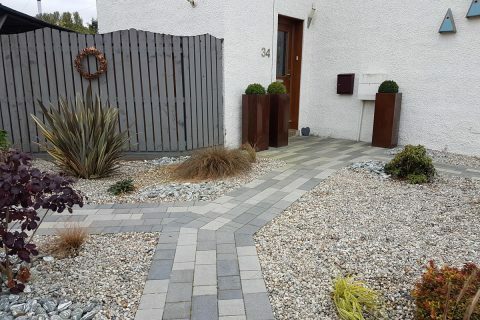 At the front door a wide space was created to make the entrance more welcoming. 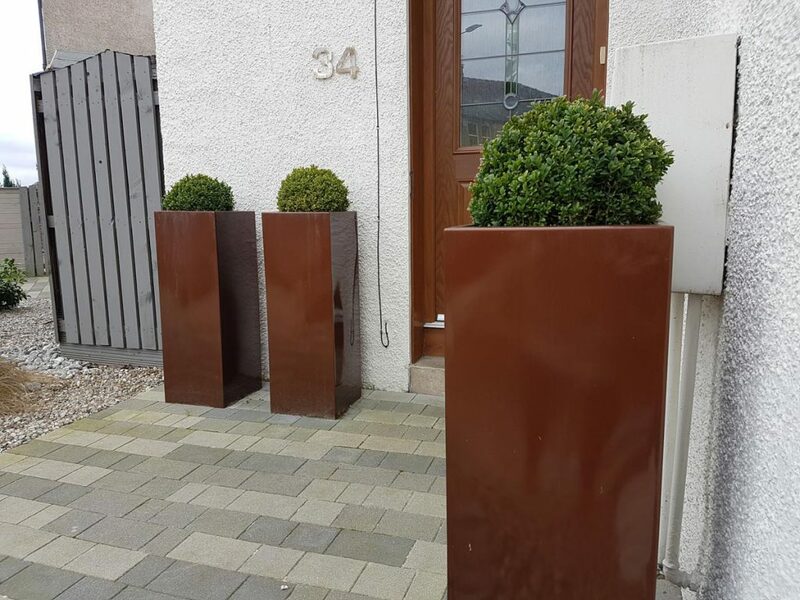 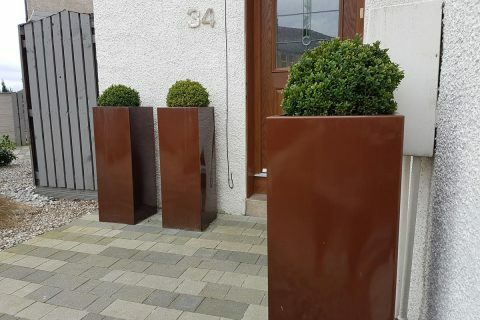 Contemporary, bronze-effect, tall containers planted with box balls make a bold statement and frame the front door. 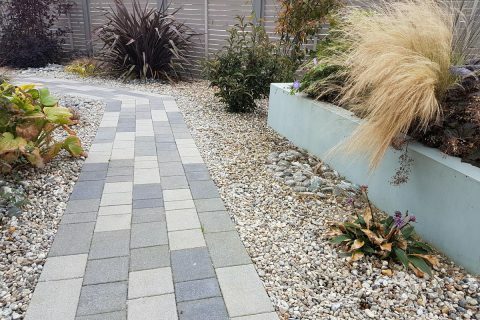 As the path leads you on the journey around the garden, there are features to discover along the way. 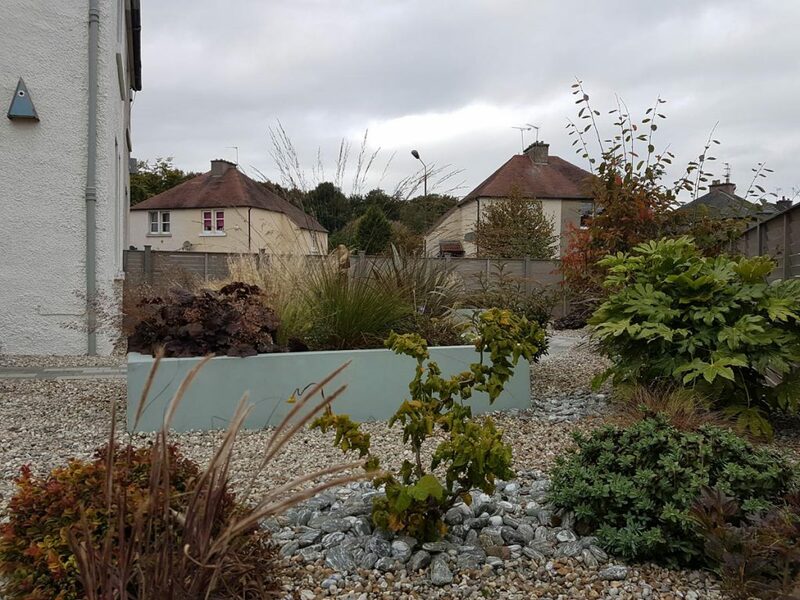 Three rendered troughs complement the contemporary feel and are painted in a muted green. 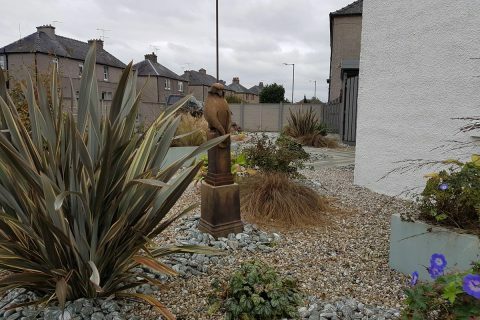 In the centre of the three troughs stands the majestic stylised eagle, creating a wonderful focal point. 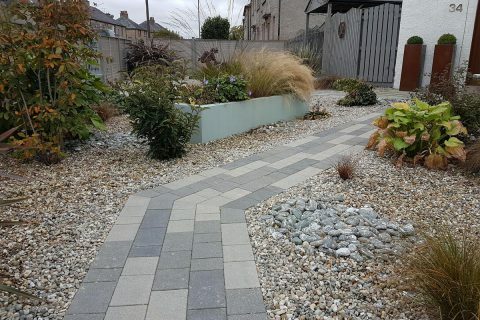 To keep the garden low maintenance it is finished in ocean pebbles with swirls of angel cobbles. 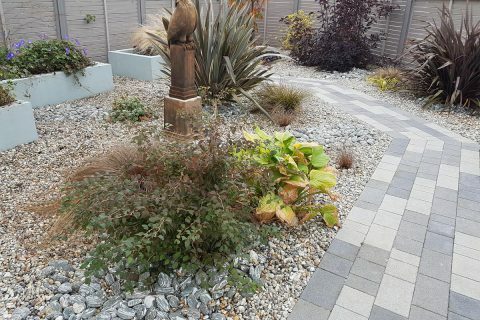 The planting is low maintenance, focusing on architectural shrubs to give strong lines and year round interest. 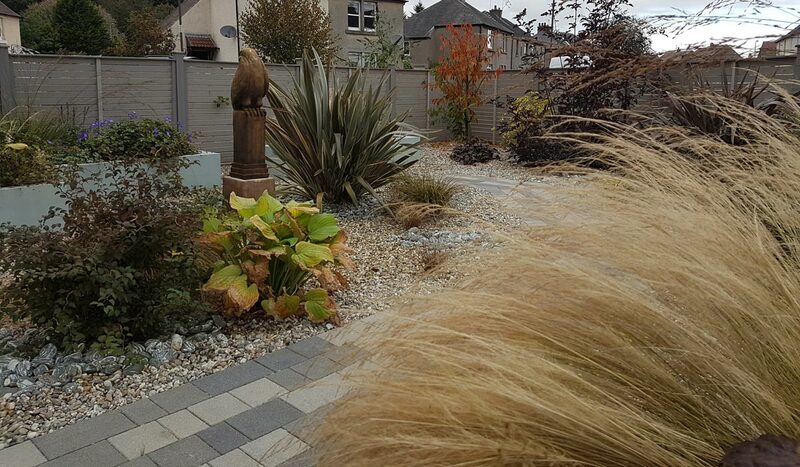 Shrubs such as phormium, viburnum, fatsia, sambucus and corylus contorta are complemented by an array of grasses such as stipa, pennisetum and molinia. 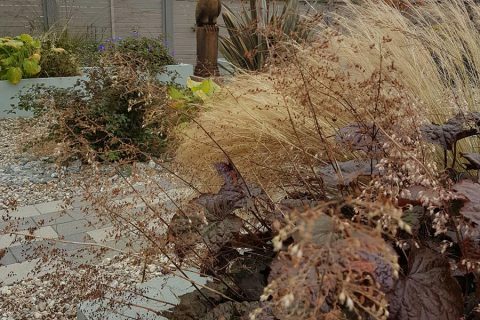 Softer herbaceous planting including salvia and geranium filled the troughs. 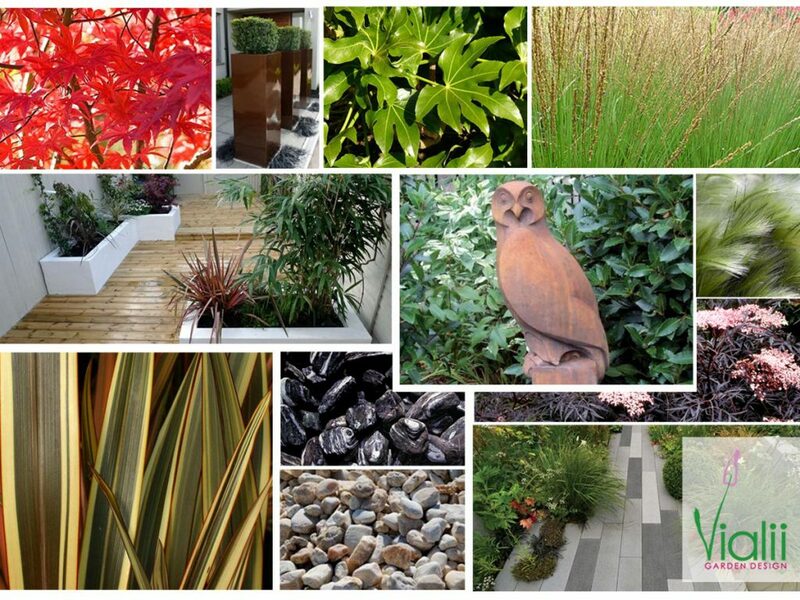 "Flowers are beautiful hieroglyphics of nature, with which she indicates how much she loves us."